Francois Besse was a French criminal, a thief and hold-up gangster. He was known as “The Eel” because he was the king of escape and disguise. After first being arrested in 1971 and sentenced to seven years in jail, he escaped. In 1973, while trying to evade police arrest, he shot himself in the chest. He was miraculously saved but sentenced to 15 years in jail. Once more he escaped in 1975. Arrested again in 1976, he spent two years in La Sante prison. La Santé was seen escape proof but Besse teamed up with notorious criminal and public enemy no 1, Jacques Mesrine to become the first men to escape from the prison. Besse was arrested again in Belgium in March 1979, but escaped from the court house in Brussels in July. Arrested again in Spain in 1982, he escaped from the prison-van. He was believed to be dead, until a hold-up in Cognac in 1993. Besse was arrested again in Tangier in 1994 and this time didn’t get away. He was finally released from prison in 2006. For this kind of life you would expect an extraordinary chart. Francois Besse had a stellium of 5 planets in Leo. Leo is a sign confident in its own gifts and abilities and also possessing tremendous stamina and perseverance. The Sun is conjunct Pluto which with Scorpio rising adds a great intensity to his life. Pluto rules the shady world of the underground and many criminals have the planet featuring strongly in their charts. It has an explosive, even violent way of working so this is what attracted Besse to his life of crime. Mercury is part of the stellium in conjunction to Jupiter. Besse would naturally have great confidence and optimism ( Jupiter in Leo ) about his plans and movements ( conjunct Mercury ) which would enable him to make escape attempts that no-one else would even dream of. The whole stellium is in the 9th house of long journeys which could explain how he turned up and committed crimes in many different countries. If there’s one planet that could be associated with his many escapes however, that would be Neptune. Neptune is the planet of illusion, when it’s strong things are often unclear and not what they seem. It’s very nature allows things to slip out of our grasp just when we thought we had hold of them. Neptune is also the master of disguise and camouflage. With his amazing story, Francois Besse would be expected to have a strong Neptune, its also likely that he would have a link to the Moon because this would add to the illusory, shifting nature of his life. 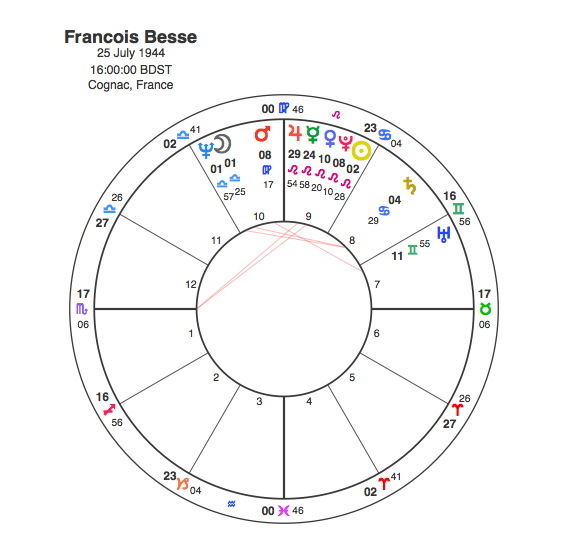 Francois Besse has an exact conjunction of the Moon and Neptune in Libra in the 10th house of career dominating the chart. The fact that it is in Libra gives him the ability to be quite rational and considered with his escape plans. Pluto was conjunct the Moon and Neptune from 1971 to 73 coinciding with his first arrest and escape together with his second arrest when he shot himself but survived. Another aspect of Besse’s chart is that so many planets in Leo together with a Moon / Neptune conjunction can give a glamorous reputation even for someone who is basically involved in criminal acts. His collaboration with the notorious Mesrine and the famous escape from La Sante has been the subject of two films. The first in 1984 came when Pluto was square Besse’s Sun. The second in 2008 was when Pluto was square his Moon / Neptune conjunction. These transits reflect his notoriety and his place in public consciousness. Francois Besse had two big conjunctions one between the Sun and Pluto that drove him to commit criminal acts, the other between the Moon and Neptune that helped him to escape the consequences on so many occasions. No wonder they called him the Eel.